This series is focused on learning how to get the proper sounds out of hand drums, learning a variety of world rhythms and having a good time while connecting with community. 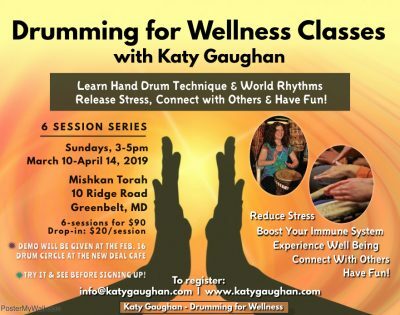 While we’re doing this, we’re benefiting from the wellness aspects of drumming, which are many! – Drumming will tune up your heart, mind and spirit! Best of all, it’s FUN! Payment accepted via PayPal, check or cash.